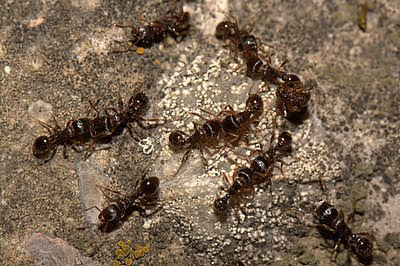 In our backyard, there is one certain spot on our limestone patio where tiny ants congregate in a huge mass. I've never really thought much about it, or observed them, really. That was until last week. Over the winter I purchased the Canon EFS 60 mm macro lens, which allows me to get very tight shots of very small things. I thought I'd try it out on the ants. I didn't really go into this trying to study them, I just wanted to get pictures. But after a while, it became evident what was going on. Can you see what is going on here? 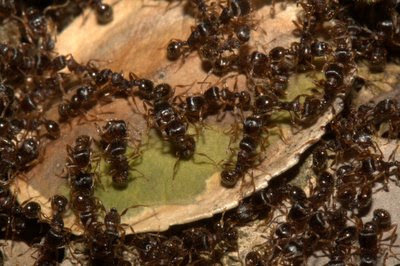 The ants looked as if they were all in direct hand to hand- or rather mandible to mandible combat. Every ant seemed to be locked up with another. Fascinating stuff. I wonder why they were doing this? I wonder what species of ant this is? Since taking these photos, I've paid more attention to the ants that I have found under rolled logs, and the diversity of species is quite fascinating. Also- Megan and I are in South Carolina right now (for my cousin Amy's wedding), although as I'm writing this we haven't gotten there! I'm trying out blogger's auto post feature. I may drop in a few SC pictures here and there. 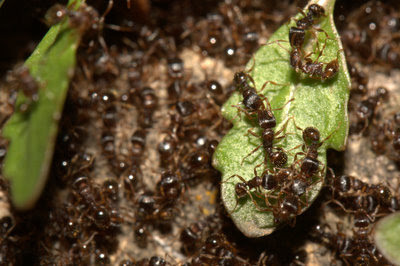 Since I have been battling ants in my kitchen I am not too crazy about this....but the photos are really great! Will look forward to South Carolina pics. Cool photos, if vaguely creepy :) Was this two colonies meeting up and duking it out? Some sort of preening thing? I wouldn't think it's reproductive, since ants don't "pair off" in that way. Tom: The gladiators were in full armor and having a medieval battle for the land. LOL, interesting post and great macro shots of these ants! Ewwwwwwww!! These are creepy! LOL Great pictures though. I look forward to your SC pix. I lived in Charleston for about 10 years and we talk about moving back someday. 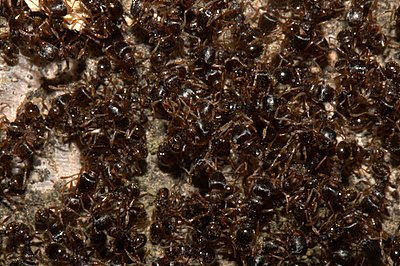 Scary ants- I think I am just glad that htis was outside! Cool. 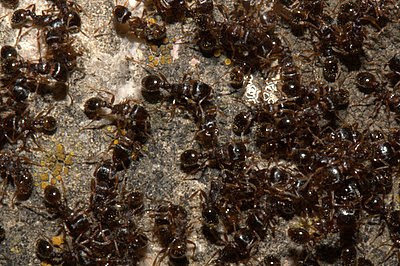 Those are pavement ants (Tetramorium sp. ), a species introduced from Europe. In the spring colonies expand their territories, and these battles are common when two bump up against each other. First off, thanks to everybody for commenting. And a special thanks goes to Alex, who has an excellent insect blog, along with a stunning insect photography website. His stuff is really great, and certainly worth a look if you haven't seen his blog and sites already! And, for everyone, the SC pics are being downloaded as I type this and we'll have some up very soon.